It is a few minutes before 7 a.m. on a Tuesday morning, but the Edge Center, home to Tech football’s offices, is buzzing. Seated in a conference room, the thumping of loud hip-hop music from a nearby room is audible. Around the long table are reporters. At one end, Tech brand manager Santino “Morpheus” Stancato is hard at work capturing photos and video. On the screen is the schedule for the day’s practice, listing various drills and workouts. The group of reporters I am sitting with are reminded that we cannot share it publicly — although given the Byzantine language in which it is written, it seems hard to believe that anyone outside of the Tech coaching staff could understand it, let alone use it to their advantage. At the head of the table is new head coach Geoff Collins. To his right is a plastic foam cup of coffee from Waffle House, a brand he has promoted since his first day on campus. To his left is a stuffed possum, perhaps emblematic of Tech football’s dormancy in recent years, approaching a streak of nearly four years without a single AP Top 25 weekly ranking. In front of him is a book whose title aptly describes the urgency of his job — Recruit or Die. It is a few minutes after 7 a.m. now, but Tech’s Media All-Access Day has just begun. Collins explains that a similar event he hosted at Temple last season was a success, so he decided to bring it to Atlanta. The goal was to give the journalists who cover the team a chance to experience its inner working, if only for a single day nearly six months removed from the start of the season. At the moment, it’s mission accomplished. At 7:04, Collins’ introductory meeting ends and the journalists file into a large auditorium for an offensive meeting. Collins noted that day that he dislikes walking into quiet rooms so directs his staff to play loud music minutes before meetings are schedule to begin. That explains the thumping. The offense launches into a rowdy sing-along to Young Jeezy’s “Put On”, and as it concludes, the meeting begins. Leading the session is offensive coordinator Dave Patenaude, who followed Collins from Temple. Patenaude’s loud, distinctly Northeastern voice and aggressive pacing across the floor make him a magnetic force. 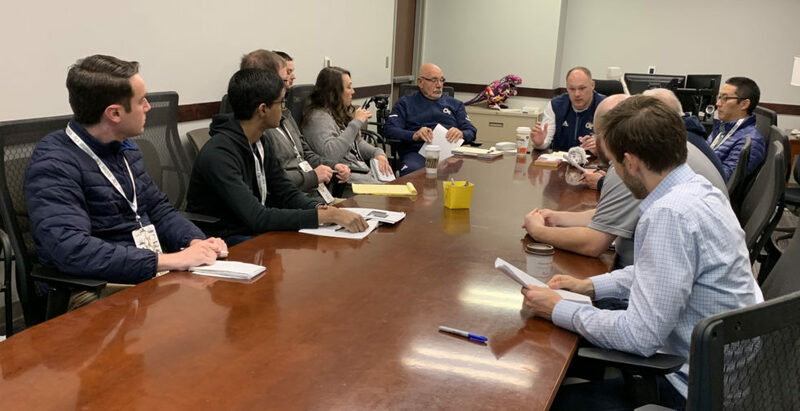 After discussing important game situations and speculating on what defensive coordinator Nate Thacker might have prepared for the day’s practice, Patenaude breaks the offense into their position groups and sends them to various meeting rooms. Like most of the writers, I follow the quarterbacks, eager to see early signs of their transition from a triple-option offense to a more conventional attack. It is a meticulous, academic affair. Patenaude diagrams plays on the board and emphasizes the importance of communication, occasionally asking the quarterbacks questions to test their understanding of the playbook. Lucas Johnson, considered by some to be the odds-on favorite to start next season, responds with a few questions of his own. Soon, it is time for the first full-team meeting of the day, and players, staff and journalists alike congregate to stream back into the team’s auditorium. Music is once again blaring and a student assistant dances energetically at the front of the room. It is not yet 8 a.m., but two sing-alongs have already broken out this morning. This time, it is Collins who calls the meeting to order. He moves briskly through a presentation, mixing footage of the previous practice, housekeeping items and inspirational quotes. With the media present, Collins emphasizes the importance of his athletes developing good relationships with journalists and mentions that he is in the process of acquiring copies of Jeremy Darlow’s book ‘Athletes are Brands Too’. A key element of Collins’ brand becomes clear midway through the meeting when three students holding “$ Down” signs run to the center of the room and shout, “Money down!” repeatedly upon his request. A mainstay of Collins-coached teams, enthusiastic aides who signal that it is a defensive third down will make appearances in practices and eventually real, live games. After a few minutes, the meeting ends and the players, already donning their jerseys, begin walking towards the practice field. Over the course of just a few hours, I had sat in four meetings led by three different coaches. It is far too early to know how smooth the adjustment will be from Paul Johnson to Geoff Collins, particularly given that the team is overhauling both its offensive and defensive schemes in the process. And kicking off the season against defending national champion Clemson means that unlike in most recent seasons, the Jackets will not walk to an easy victory Week One. But if spring practice is any indication, Collins and his staff are well on their way to instill a new, loud, energetic culture.